For a film whose climax involves using a cannon to blow a hole through a state-of-the-art safe, Thunderbolt And Lightfoot is heavy on subtlety and suggestion. The 1974 directorial debut of Michael Cimino packs a lot of of subtext into what could have been a standard caper film, albeit one whose final, headlong descent into grimness marked it as a product of its pessimistic era. But even before the film’s finale, it’s filled with nods to changing times and the traumatic effects of recent American history, themes Cimino explored on an operatic scale in his next film, The Deer Hunter. Here, when Thunderbolt And Lightfoot’s heroes arrive at a plaque noting, “The one-room schoolhouse evokes a vision of a vanished America” outside a building that’s been preserved as a landmark, the film doesn’t dwell on the significance, but doesn’t look away from it, either. If America ever had room for the film’s free-spirited criminals, not villains so much as men determined to live outside society’s confines, it doesn’t have room for them now. A product of Clint Eastwood’s Malpaso Company, which stayed especially busy in the early 1970s, the film stars Eastwood as a man best known as “The Thunderbolt,” a Korean War hero turned criminal turned country parson. After Thunderbolt dodges an attempt on his life by his old partners Red (George Kennedy) and Eddie (Geoffrey Lewis)—who try to gun him down at the pulpit—he hooks up with Lightfoot (Jeff Bridges), a grinning, devil-may-care drifter whose shaggy hair and colorful attire mark him as a member of the next generation after Thunderbolt’s. Together, they float through Montana’s back channels and small towns, stealing cars, picking up women (including The Dukes Of Hazzard’s Catherine Bach), and getting to know each other. This last aspect is one of the film’s most compelling qualities. When Thunderbolt parts ways with Lightfoot early in the film, the look on the younger man’s face is close to heartbreak. He senses that together, they could have had something. 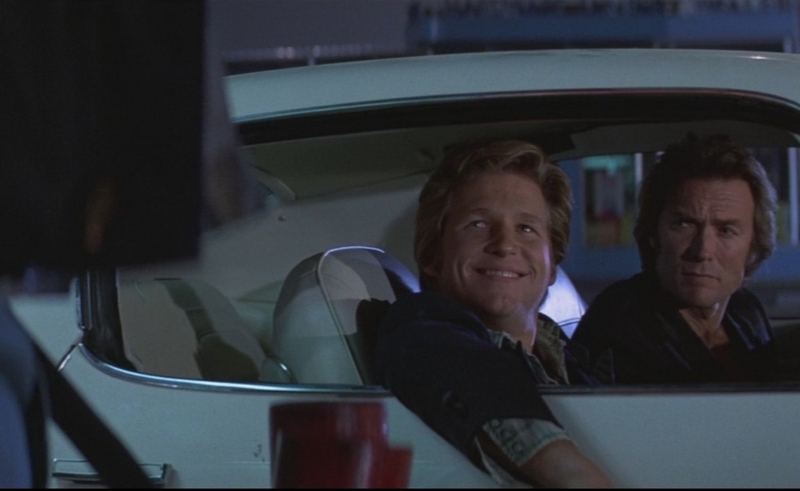 When they reunite minutes later, after Thunderbolt spies Red at a bus station, Lightfoot is overwhelmed with joy. Cimino loads the script with hints that the men have feelings for each other they don’t quite understand, and Bridges’ performance—which earned him a Best Supporting Actor nominations—runs with the notion. When the final act requires him to wear a dress to seduce a security guard, a scheme seemingly borrowed from the Bugs Bunny playbook, it seems less like a disguise than a confirmation. Cimino frames the action against the natural wonder of Montana, making great use of the Panavision frame and letting the natural features dwarf his characters. He also keeps providing reminders that the frontier closed a long time ago. In the film’s rich, funny middle section, Thunderbolt and Lightfoot form an uneasy truce with the vicious Red and the nervous Eddie, and take up day jobs to earn money to fund a robbery. Bridges becomes a landscaper, and one shot of him working on one of the many lawns trailing behind interchangeable suburban houses breaking up the beauty of Big Sky country says more than the dialogue ever could. The film moves at a leisurely pace, and is all the better for it. Cimino takes his time, letting strange characters, like a madman with a pet raccoon who picks up the hitchhiking Thunderbolt and Lightfoot, have their moment. And he gives the cast plenty of room to explore their characters. Both Kennedy and Lewis turn in colorful performances, but it’s Eastwood and Bridges’ film, and their ill-defined, tender friendship makes the movie. They’re kindred spirits, whatever their differences in age and temperament. But what unites them also makes them misfits in a world that keeps crowding out what it can’t tame. Cimino went on to make Heaven’s Gate, a calamitous production about the closing of the West. That film got away from him, but his debut shows he already understood the many small tragedies of that closing’s aftermath. There’s nothing here beyond a trailer and a poster gallery. And while it’s nice to have the film back in print on DVD, the photography here, by Frank Stanley, cries out for a high-def Blu-ray version yet to be released in the States.